The aim of the research was to study the influence of the preparation procedure of a colloidal silver solution on the properties of fibres from polylactic acid (PLA fibres). Colloidal silver solutions were prepared in two solvents, i.e. water and ethanol, under appropriate conditions and applied to the PLA fibres with the exhaustion method in order to achieve their antimicrobial activity. The shape, size and chemical composition of silver nanoparticles (Ag ND) in the colloidal solution were determined with UV-Vis spectroscopy and transmission electron microscopy with energy-dispersive X-ray spectroscopy (EDS). The morphological properties of treated fibres were studied with scanning electron microscopy, whereas the presence of Ag ND on their surface was proved with the EDS analysis. The concentration of Ag on the treated fibres was determined with inductively coupled plasma mass spectroscopy. The bactericidal properties of treated PLA fibres were studied in terms of bacterial reduction for the bacterium Escherichia coli according to the ASTM E 2149-01 standard method. The research results showed that mostly monomers of Ag ND were formed in water as well in ethanol colloidal solution, which were spherical in shape and the size of which did not exceed 15 nm. The used solvent greatly influenced the amount of adsorbed Ag on the PLA fibres. The concentration of the adsorbed Ag was higher on the fibres treated in water than in ethanol. The application of Ag ND from both solvents provided excellent antibacterial protection of PLA fibres. Unlike water, the treatment of fibres in ethanol caused morphological changes of fibres. OKSMAN, Kristiina, SELIN, Johan-Fredrik. Natural fibers, plastics and composites. Edited by Frederick T. Wallenberger and Norman Weston. ZDA : Kluwer Academic Publishers, 2004, 149–165. Biorazgradnja tekstilnih vlaken in njihova protimikrobna zaščita. Uredili SIMONČIČ, Barbara, TOMŠIČ, Brigita. 1. izdaja. Ljubljana : Univerza v Ljubljani, Naravoslovnotehniška fakulteta, Oddelek za tekstilstvo, 2010. Product and Applications [online], [citirano 15. 7. 2013]. <http://www.natureworksllc.com/Product-and-Applications>. Silver in healthcare: Its antimicrobial efficacy and safety in use. Edited by Alan B. G. Lansdown. Cambridge : The Royal Society of Chemistry, 2010, 280. TOMŠIČ, Brigita. Vpliv velikosti delcev srebra na baktericidno učinkovitost celuloznih vlaken. Tekstilec, 2009, 52(7–9), 181–194. WANG, Hongbo, WEI, Qufu, GAO, Weidong. Sputter deposition of antibacterial nano-silver on PLA nonwoven medical dressings. AATCC Review, 2009, 9(11), 34–36. Ingeo™ Biopolymer 6201D Technical Data Sheet [online]. http://www.natureworksllc.com/~/media/Technical_Resources/Technical_Data_Sheets/TechnicalDataSheet_6201D_fiber-melt-spinning_pdf.pdf. Accessed 2 September 2013. In the research, the influence of the addition of a surface active agent (surfactant) into a dyebath on the adsorption of the anionic acid dye C.I. Acid Red 14 (AR14) onto polyamide 6 knitwear (PA 6) was studied. The dyeing was performed in the apparatus Launder-ometer at four different dyeing temperatures, i.e. 40, 50, 60 and 70 °C, and at pH 4 until the equilibrium was reached (360 minutes). The following surfactants and their mixtures were used in the research: cationic surfactant dodecyltrimethylammonium bromide (DTA), anionic surfactant sodium dodecylsulphate (SDS), nonionic surfactant Triton X-100 (TX100), and the mixtures DTAB/TX100 and SDS/TX100. The dyeing was performed in the absence as well as in the presence of surfactants. The concentration of the ionic surfactant was 1.0 × 10–4 mol/kg, which is lower than the critical micellar concentration (c.m.c. ), whilst the concentration of the nonionic surfactant was 5.0 × 10–3 mol/kg, i.e. higher that c.m.c. The degree of exhaustion was calculated by determining the concentration of the dye AR14 in the dyebath before and after the dyeing, using a UV-VIS spectrophotometer. The K/S values were calculated from the measured reflectance values with the use of a reflectance spectrophotometer. According to the obtained results of the degree of exhaustion and K/S values, it can be concluded that the dye-fibre interactions are influenced by the dye-surfactant, surfactant-surfactant and surfactant-fibre interactions. The influence of the TX100 surfactant among the solely studied surfactants on the adsorption of the AR14 dye onto PA6 knitwear was obtained as the most effective, compared to the SDS surfactant, which acted as a blocking agent, or the surfactant DTAB, the influence of which was scarcely perceived, the use of the surfactant mixture being the most optimal. DATYNER, Arved. Surfactants in textile processing. New York; Basel : Marcel Dekker, 1983, 77–107. Colorants and auxiliaries : organic chemistry and application properties. Volume 2, Auxiliaries. Edited by John Shore. Manchester : Society of Dyers and Colourists, 2002, 642–645. Aspland, J. Richard. Textile dyeing and coloration. Research Triangle Park : American Association of Textile Chemists and Colorists, 1997, 410. KERT, Mateja, SIMONČIČ, Barbara. Pomen interakcij barvilo-tenzid v barvarstvu. 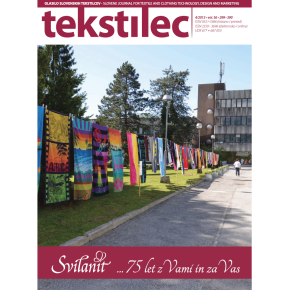 Tekstilec, 2007, 50(7-9), 187–207. SIMONČIČ, Barbara, KERT, Mateja. Vpliv strukture in sestave površinsko aktivnih snovi na interakcije barvilo-tekstilni substrat. Tekstilec, 2002, 45(11–12), 327–333. SIMONČIČ, Barbara. Teoretične osnove barvanja. 1. izdaja. 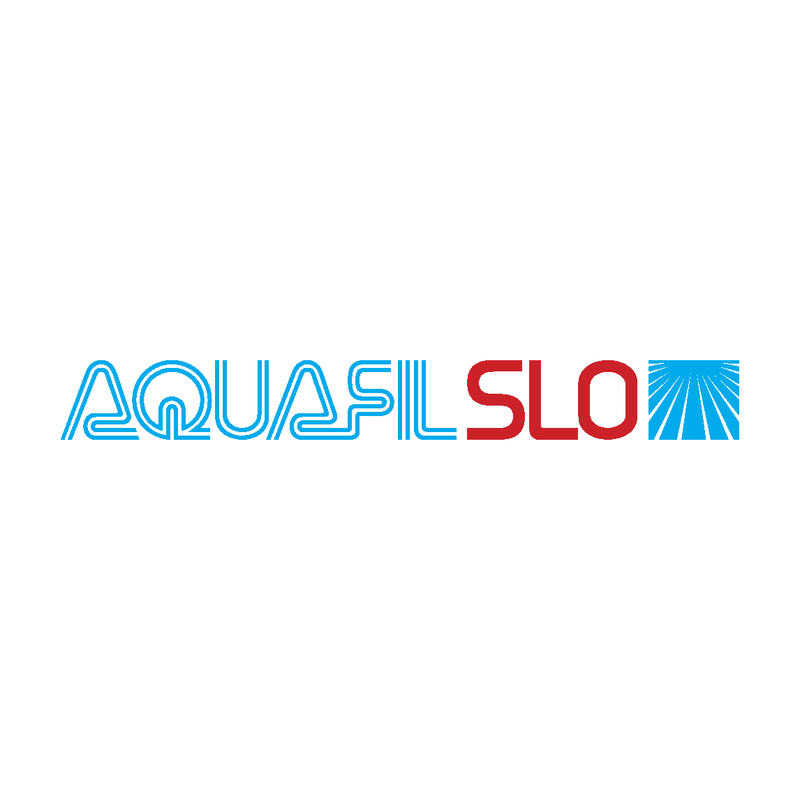 Ljubljana : Univerza v Ljubljani, Naravoslovnotehniška fakulteta, Oddelek za tekstilstvo, 2009, 120. Karmakar, S. R., Patel, S. G., Pandaya, N. R., Interaction of non-ionic surfactants with some acid dyes, Indian Journal of Textile Research, 1989, 14, 93–97. KERT, Mateja, SIMONČIČ, Barbara. Vpliv strukture neionskega tenzida na interakcije tenzid-tenzid. Tekstilec, 2007, 50(1–3), 35–49. In 3D computer applications for modelling and animation, textile materials are considered as dynamic objects since they interact with different external forces, e.g. collision, wind, gravitation, turbulence etc. Different 3D computer graphics software resolves cloth modelling and simulation issues in various ways. When a given 3D model is subdivided into a large number of small areas (segments), it becomes virtually pliable and flexible. Consequently, the object can demonstrate realistic fabric drape or any other form of textile behaviour when it undergoes various influences of dynamic forces. The aim of the research was to compare the usability and effectiveness of two 3D computer applications for cloth modelling and simulation, i.e. 3ds Max and Blender. Blender as open source and 3ds Max as professional software were chosen, as they are not specialised CAD systems for 3D cloth simulation, yet they are extensively used for a textile visualisation in architecture, apparel visualization, car industry etc. Virtual textiles with a different material composition and different parameters offered by the databases of used 3D computer applications were simulated. In the research, the force of gravitation was examined, namely during the free fall of a cloth on a collision object, i.e. cube, sphere and cylinder. In the results, simulations and renderings of chosen cloth gravitation and collision were studied visually and by using image analysis. Moreover, the usability of both applications was estimated and compared with: 1) number of steps needed to prepare the set for the collision test of a virtual textile; 2) number of textile materials offered by an application; 3) number of possible parameter settings for a defined textile material; and 4) number of frames and time needed for the collision and final textile drape simulation. The analysis results demonstrate that in the field of cloth simulation, the use of Blender is restricted to nonprofessional users, whereas the solutions of 3ds Max application are more complex, with more specialized settings of textile and material parameters. Furthermore, a comparison with professional terms and solutions pointed out a higher level of the 3ds Max application. The analysis of the usability of two applications showed the advantage of 3ds Max; however, only in the case of settings of material parameters and visual estimation. The measurements of time, needed for the collision and draping showed that the simulation of one frame in 3ds Max is more time and processor consuming. The analysis of final drapes occurred with the help of a visual evaluation and image processing, i.e. with area and perimeter, and their correlation. The results presented that the simulations of Blender, though depending on the material used, in generally fit worse the shape of the collision object than the simulations of 3ds Max. The evidence is also greater scattering of the correlation point of area and perimeter around the linear trend line. In the conclusion, the estimation of results is presented visually and numerically. Both, in the case of application usability and the quality of drape simulations, the 3ds Max solutions are more corresponding and professional. WEIL, Jerry. The synthesis of Cloth object. Computer Graphics (Proc Siggraph), 1986, 20(4), 49−54. http://dx.doi.org/10.1145/15886.15891. FEYNMAN, Carl Richard. Modelling the Appearence of Cloth. Master disertation. Massachusetts Institute of Technology, Cambridge, 1986. TERZOPOULOS, Demetri, PLATT, John, BARR, Alan, FLEISHER Kurt. Elastically deformable models. Computer Graphics, 1987, 21(4). http://dx.doi.org/10.1145/37402.37427. THALMANN, Nadia Magnenat, THALMANN, Daniel. Cloth animation with self-collision detection. Modelling in Computer Graphics. Kunii T. L. (ur. ), Berlin, Springer-Verlag, 1991, 179−187. DHANDE, Sanjay Govind, RAO P. V. Madhusudhan, MOORE L. Chris. Geometric modelling of draped fabric surfaces. Graphics, design and visualisation, Pros Int Conference on Computer Graphics. Mudur S. P. (ur. ), Pattanaik S. N. Bombay (ur. ), Jaico Publishing house, 1993, 173−180. CHEN, Bijian, GOVINDARAJ, Muthu. A physical based model of fabric drape using flexible shell theory, Textile Research Journal, 1995, 65(6), 324−330. http://dx.doi.org/10.1177/004051759506500603. EBERHARDT, Bernhard, WEBER, Andreas, STRASSER, Wolfgang. A fast flexible particle system model for cloth draping. IEE, Computer Graphic and Application, 1996, 16(5), 51−59, http://dx.doi.org/10.1109/38.536275. SUL, In Hwan, KANG, Tae Jin. Improvement of drape simulation speed using constrained fabric collision. International Journal of Clothing Science and Technology, 2004, 16(1/2), 43−50. http://dx.doi.org/10.1108/09556220410520342. BARAFF, David, WITKIN, Andrew. A large steps in cloth simulation. Proceedings of Computer Graphics, Annual Conference Series, 1998, 43−54. Optitex, 2D and 3D CAD/CAM Fashion Design Software [online] http://www.optitex.com. Accessed 15 January 2013. 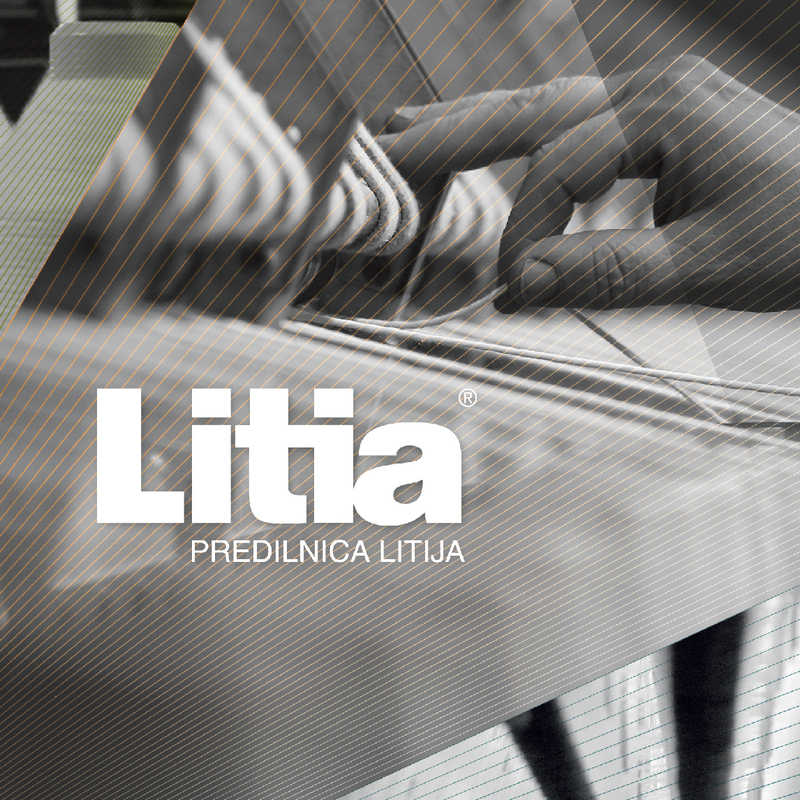 Lectra, Fashion PLM, CAD/CAM solution and service. http://www.lectra.com/en/index.html. Accessed 15 July 2013. Gerber Technology [online] http://www.gerbertechnology.com. Accessed 15 July 2013. Human Solution Assyst avm [online] http://www.human-solutions.com. Accessed 9 October 2013. ŠTANC, Barbara, LUKAČ, Tjaša, JEVŠNIK, Simona, RUDOLF Andreja, STJEPANOVIČ, Zoran. Izdelava prototipa tekmovalnega dresa smučarja skakalca. Tesktilec, 2009, 52(7-9), 206−221. Blender Foundation [online] http://www.blender.org. Accessed 17 January 2013. Autodesk 3dsMax [online] http://usa.autodesk.com/3ds-max/. Accessed 17 January 2013. Autodesk Maya. [online] http://usa.autodesk.com/maya/ . Accessed 17 January 2013. KOČEVAR, Tanja Nuša, GABRIJELČIČ TOMC, Helena. Animiranje in primerjava 3D simulacij tekstilij v programih Blender in 3ds Max = Animation and comparison of 3D textile simulations in Blender and 3ds Max. V: SIMONČIČ, Barbara (ur. ), GORJANC, Marija (ur.). 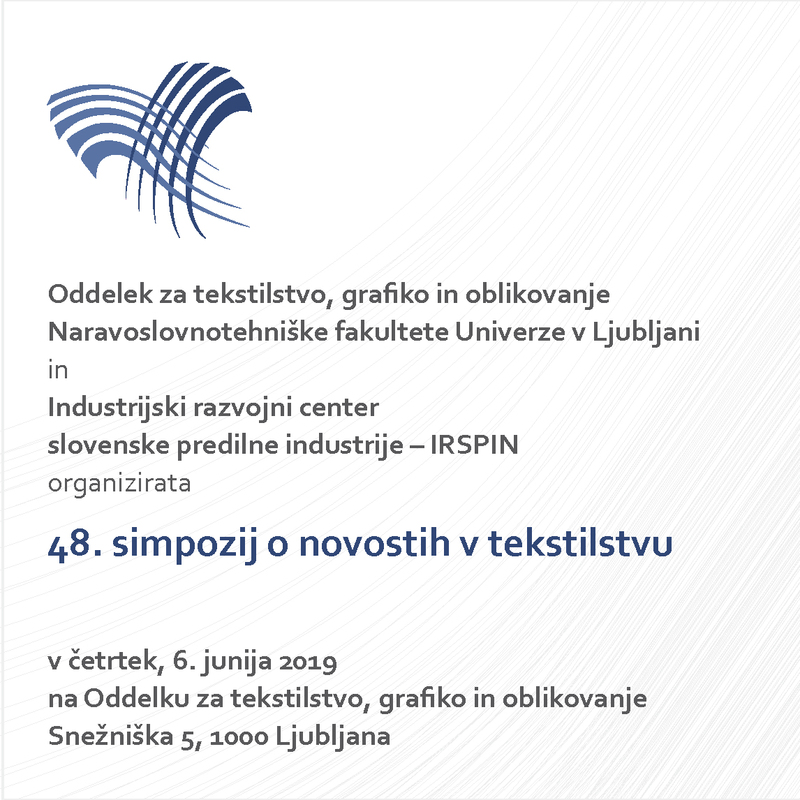 43. simpozij o novostih v tekstilstvu, Tekstilna obzorja, Ljubljana, Tekstilna obzorja : zbornik izvlečkov. Ljubljana: Naravoslovnotehniška fakulteta, Oddelek za tekstilstvo, 2012, 44. Maxon 3D for the real world, Cinema 4D [online] http://www.maxon.net/. Accessed 9 October 2013. Newtek Lightwave [online] https://www.lightwave3d.com/. Accessed 9 October 2013. KLADNIK, Rudolf, Visokošolska Fizika, 1. del, mehanski in toplotni pojavi, Državna založba Slovenije, 1989, 231. GOLDBERGER, L. Marvin, WATSON, M. Kenneth. Collision Theory. Dover Publications, 2004, 919. HU, Jinlian. Structure and mechanics of woven fabrics. Boca Raton, Fla. : CRC Press; Cambridge : Woodhead Pub., 2004, 307. GERŠAK, Jelka. Mehanske in fizikalne lastnosti materialov. Maribor, Fakulteta za strojništvo, Oddelek za tekstilstvo, 2006, 156. KOBOVC, Dragica. Simulacija obnašanja tkanin in pletiv : diplomsko delo. Maribor, Fakulteta za strojništvo, Oddelek za tekstilstvo, 2010. HEARLE, John W. S., BACKER, Stanley, GROSBERG, Percy. Structural mechanics of Fibres, Yarn and Fabrics, Volume 1. John Wiley & Sons Inc. 1969, 482, PMid:4179568. KERLOW, Isaac. The art of 3D : computer animation and effects. Wiley, 2009, 499. PARENT, Rick. Computer animation, Algorithms and Techniques. Morgan Kaufmann, 2012, 542. LOJEN-ŽUNIČ, Darja, JEVŠNIK, Simona. Some Aspect of Fabric Drape. Fibres and Textiles in Esatern Europe, 2007, 15(4), 39−45. MURDOCK, L. Kelly. 3ds Max 2012 Bible. 1 ed. Wiley, 2011, 1250. CHOPINE, Ami. 3D Art Essentials : the Fundamentals of 3D Modeling, Texturing and Animation. 2011, 274. BIRN, Jeremy. Digital Lightning and Rendering. 2. ed. New Riders, 2006, 432. PLUMLEE, Traci May, EISCHEN, Jeffrey, KENKARE, Narahari, PANDURANGAN, Pradeep. Evaluating 3D shape simulations : Method and Metrics [online] http://www.ncsu.edu/project/ntcprojects/projects/F02-S08/Paper_Indedec_Sept03.pdf. Accessed 20 January 2013. BEHERA, B. K., PATTANAYAK, Ajit Kumar. Measurement and modeling of drape using digital image processing. Indian Journal of Fibre & Textile Research, 2008, 33, 230−238. KENKARE, Narahari, PLUMLEE, Traci May. Fabric Drape Measurements: a modified Method Using Digital Image Processing. Journal of Textile and Apparel, Technology and Measurement, 2005, 4(3). [online] http://faculty.mu.edu.sa/public/uploads/1345907225.1717Plumlee_full_148_05.pdf. Accessed 25 January 2013. HAMDI, Thuraya, GHITH, Adel, FAYALA, Faten. Study of drape parameter using image analysis. International Journal of Engineering Science and Technology, 2013, 5(7), 1456− 1464. ImageJ [online] http://rsbweb.nih.gov/ij/. Accessed 23 January 2013. RUSS, C. John. The Image Processing Handbook, 6th ed. CRC Press 2011, 885. MOGGRIDGE, Bill. Designing Interactions. The MIT Press, 1.ed, 2007, 766. VIDMAR, Žan. Primerjava različnih upodobljevalnikov v programu Autodesk Maya : diplomsko delo. Naravoslovnotehniška fakulteta, Oddelek za tekstilstvo, 2013, 49. Klara Kostajnšek, univ. dipl. ing. Apart from their soft feel and good water absorbency, cotton fabrics are also characterised by good heat conductivity, air permeability and breathing. By increasing the open surface of one-layer fabrics, their air and water vapour permeability and heat conductivity should increase as well, whereas the protection against UV rays, on the other hand, which is especially important for summer clothes, decreases. The aim of the research was to establish the influence of multilayer cotton fabric constructions on the properties connected with porosity, i.e. heat resistance (RcT), water vapour resistance (ReT), UV permeability (UPF) and air permeability (AP). One layer, two-weft and double cotton fabric constructions were woven from white, blue and black yarn with fineness 8 × 2 tex, warp density 40 ends/cm and weft density 60 picks/cm, taking into consideration the colour distribution of yarns in the fabrics as well. The research results showed that the most optimal construction characterises multilayer two-weft and double fabrics. Among the studied fabrics, a positive correlation was established between the porosity of fabrics and their air permeability or UPF, respectively, and a negative correlation between the porosity of fabrics and their heat conductivity or water vapour permeability, respectively. The correlation between the calculated number of pores of individual samples, as an important factor in porosity, and the studied permeability properties (i.e. heat resistance, water vapour resistance, UV permeability and air permeability) was higher than the correlation between the porosity of samples and the above mentioned permeability properties. POSTLE, Ron. Screening application of textile materials: an Australian perspective. V 4th International Textile, Clothing & Design conference ITC&DC: book of proceedings. Edited by Z. Dragčević. Zagreb : Faculty of Textile Technology, University of Zagreb, 2008, 1108−1111. ZAMPETAKIS, Aristotelis, KATSAROS, Giorgos. Optimization of wear comfort parameters for summer cloths. V 8th AUTEX conference : proceedings. Biella, Italy, 2008. HES, Lubos. Heat, moisture and air transfer properties of selected woven fabrics in wet state. V Proceedings of TBIS 2008 Textile Symposium. Hong Kong, China, 2008, 968−976. DIMITROVSKI, Krste, KOSTAJNŠEK, Kostanjšek. Evaluation of permeability properties of lightweight cotton fabrics with different construction. V 9th AUTEX conference : proceedings. Izmir, 2009, 69−74. Textiles – Physiological effects – measurement of thermal and watervapour resistance under steady-state conditions (sweating guarded-hotplate test). ISO 11092:1993. HES, Lubos. Non-destructive of comfort parameters during marketing of functional garments and clothing. Indian Journal of Fibre & Textile Research, 2008, 33, 239-245. Tekstilije – Zaščitne lastnosti pred sončnimi ultravijoličnimi žarki – 1. del : Metoda preskušanja za oblačilne tekstilije. SIST EN 13758-1:2002. DOBNIK DUBROVSKI, Polona. Volume porosity of woven fabrics. Textıle Research Journal, 2000, 70(10), 915−919. http://dx.doi.org/10.1177/004051750007001011. DOBNIK DUBROVSKI, Polona, GOLOB, Darko. Effects of woven fabric construction and color on ultraviolet protection. Textıle Research Journal, 2009, 79(4), 351−359. http://dx.doi.org/10.1177/0040517508090490. URBAS, Raša, KOSTAJNŠEK, Klara, DIMITROVSKI, Krste. Impact of structure and yarn color on UV properties and air permeability of multilayer cotton woven fabrics. Textıle Research Journal, 2011, 81(18), 1916−1925. http://dx.doi.org/10.1177/0040517511413326. Arahne [online] <http://www.arahne.si/>. April 2013. In this work, the tensile properties of a sewing thread, i.e. tenacity, breaking elongation and initial modulus of two common industrial sewing polyester-polyester core spun threads, were studied at four sewing stages. Firstly, the needle heat was measured at different speeds from 1000 rpm to 4700 rpm of an industrial lockstitch sewing machine with the inserted thermocouple method. Secondly, the tensile properties of a thread were compared at different predefined sections of the sewing thread in the sewing process. The results show that the needle heat and bobbin thread interaction has a great impact on the sewing thread tensile strength, while the tensile strength is minimal at the point when the machine stops and the thread is in direct contact with the hot needle. Tenacity, breaking elongation and initial modulus decrease substantially with a higher speed of the machine as the needle temperature increases. At 4000 rpm of the sewing speed, the sewing thread loses 50% of its tenacity as the needle temperature reaches nearly 250 °C, the impact being higher for higher count (linear densities) threads. WINKLER, G. Modern sewing threads. V 4th International seminar on developments in production and application. Shirley Institute, Manchester, 1971, 1–21. CROW, R. H., CHAMBERLAIN, N. H. The Performance of sewing threads in industrial sewing machines. Clothing Institute Technological Report. London, 1969, No. 21. KAUR, R. Seam strength prediction for workwear fabrics : M. Tech Thesis. National Institute of Technology, Jalandhar, 2007. HES, Lubos. Method for measuring needle temperature by thermocouple, Czech Republic Patent No.255597. 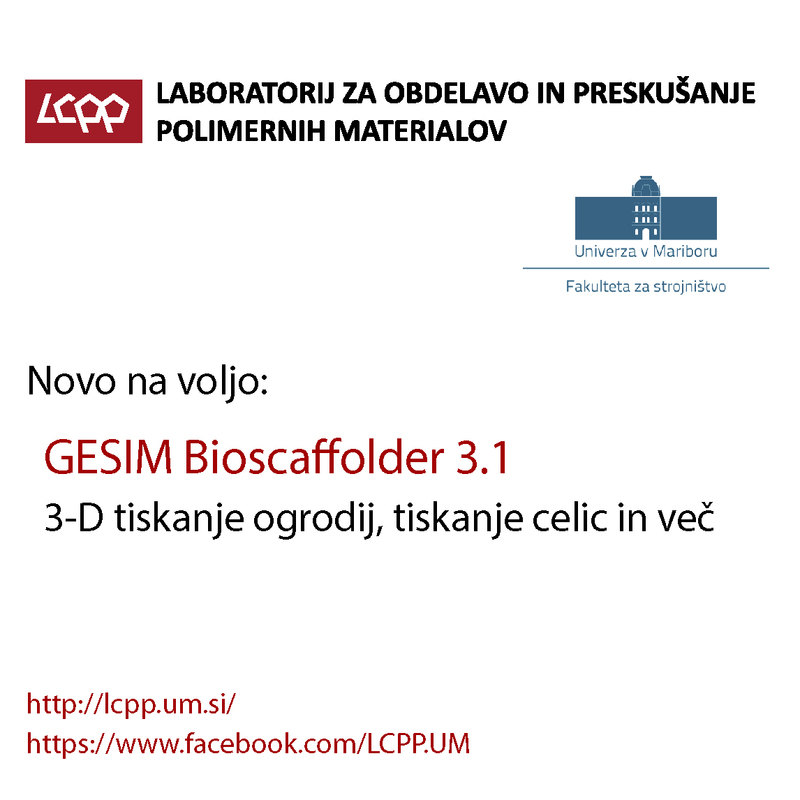 [online] http://spisy.upv.cz/Patents/FullDocuments/255/255597.pdf. Accessed 5 December 2013.